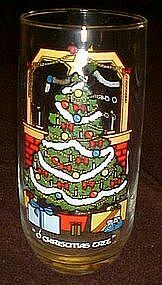 This is the "O Christmas tree" promotional drinking glass from the 1983 Christmas collection. round bottom style and measures 6" tall. Nice bright crisp colors. Christmas tree on the front, and partial words to the song on the back. Perfect!